Among the different kinds of leathers used to bind books, pigskin can often be recognized by a distinctive creamy colour and a hardness that can look almost like plastic. 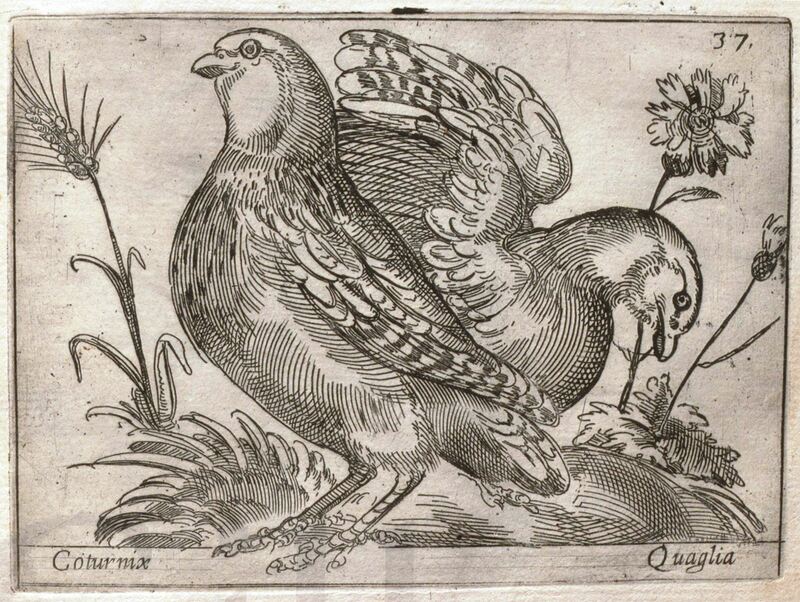 As one of our in-house experts noted about the sixteenth-century binding shown here, “it just screams ‘pig’!”. Books from this period were generally acquired unbound, allowing owners to bind volumes according to their tastes and budgets. Sometimes owners bound several books together, and this book is an example. The volume contains two titles: Persicarum rerum historia in xii. libros descripta, a History of Persia by sixteenth-century historian and spy Pietro Bizzarri (dates uncertain); and Rerum Scoticarum historia, a history of Scotland by Erasmian humanist George Buchanan (1506-1582). 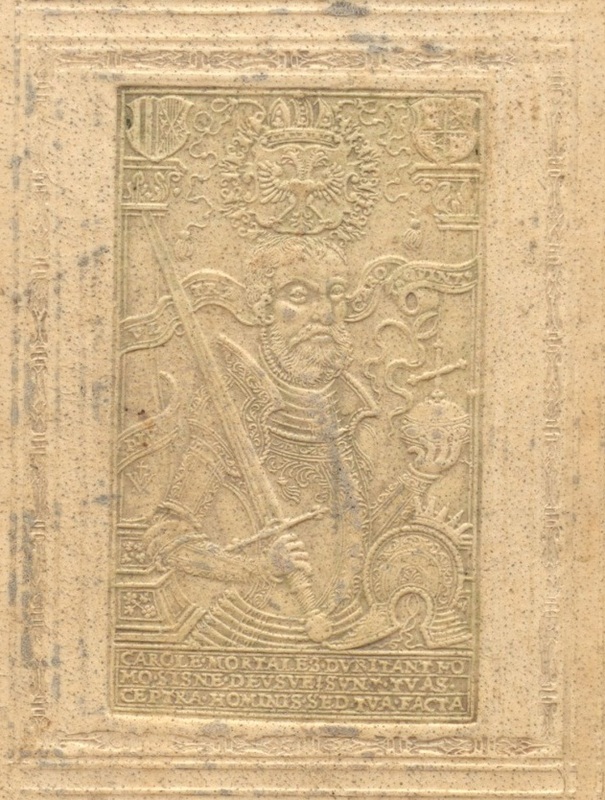 Close-up of central panel of cover stamp, showing Charlemagne. 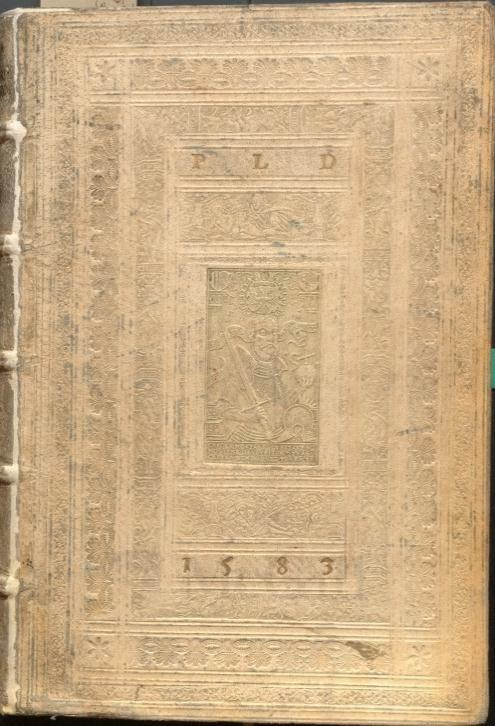 The McGill panel is an exact match of that description, and the back cover (though less well preserved and more difficult to make out) seems to show the Duke of Saxony mentioned by Coutts and Stephen, which would be fitting given that Bizzarri’s book was dedicated to Augustus I, Duke of Saxony. The Duke’s coat-of-arms faces the dedication page. But there are many less visible examples. One such can be seen in the dozens of books that were previously owned by the Literary and Historical Society of Quebec (LHSQ). The LHSQ was founded in Quebec City in 1824 by George Ramsay, 9th Earl of Dalhousie, governor-in-chief of British North America 1820-28. 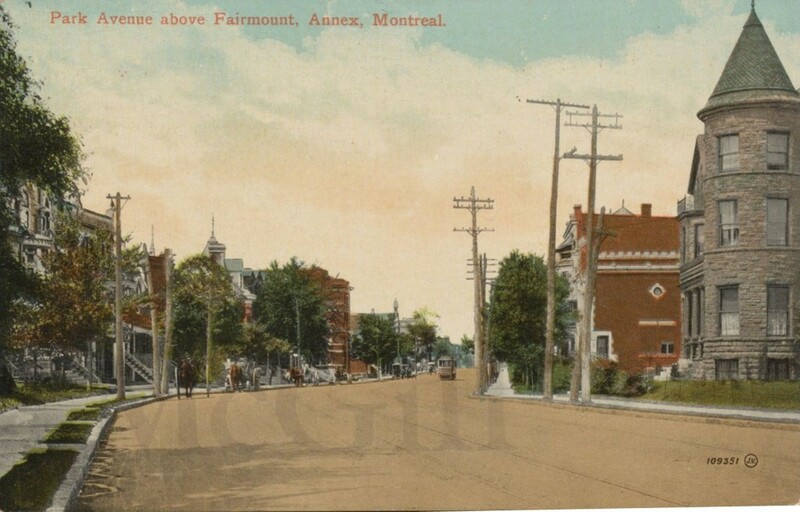 It was open to francophones and anglophones from its beginning, and is the oldest learned society in Canada that is still in existence. Volumes at McGill previously owned by this library, or likely to have been held by it for a time (e.g. from other libraries known to have been acquired by the LHSQ), date from the 15th to the 19th century on topics ranging primarily across history, literature, philosophy, religion and science. 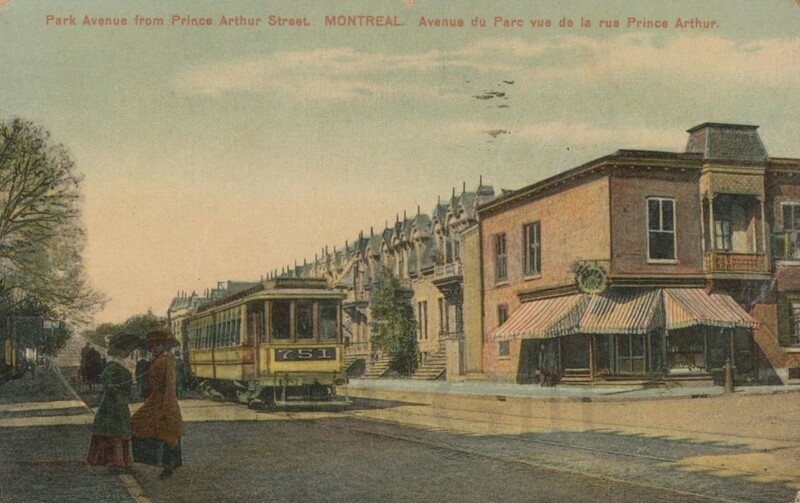 They offer a glimpse of the interests and acquisitions of earlier Quebec readers, and preserve part of the history of personal and institutional collections through various signs of changing ownership and use. Indications of LHSQ and related ownership. From 1868, the LHSQ library was housed within Morrin College, now the Morrin Cultural Centre, where it remains today. 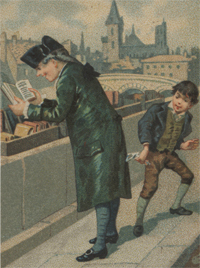 The library continued to grow through gifts from personal libraries as well as by absorbing other libraries. 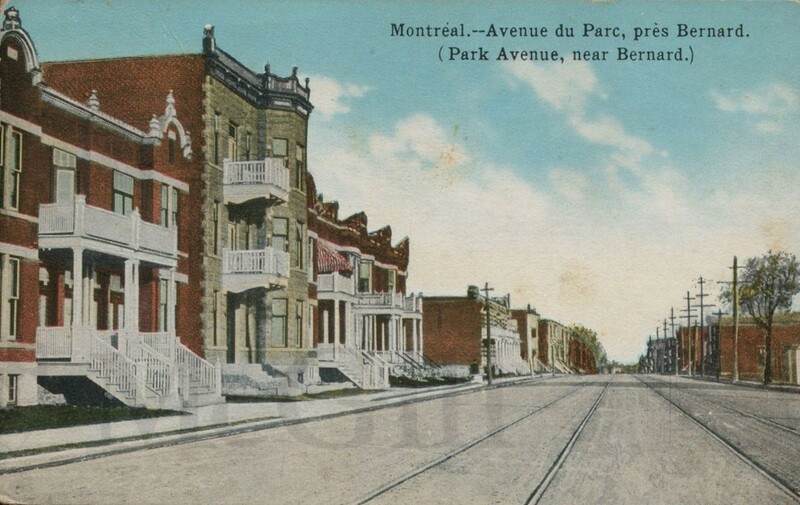 It had already absorbed in 1866 the libraries of the Quebec Library Association and the earlier subscription library called simply the Quebec Library, formed in 1779. 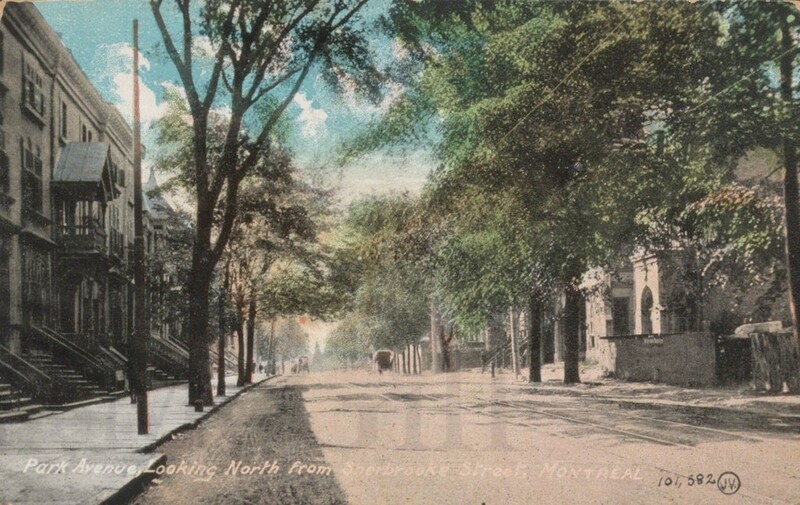 The LHSQ also took over the supervision, in 1916, of the separate “Aylwin Library” of Morrin College, which had been established some years earlier through the donation of the private library of Quebec lawyer, politician and judge Thomas Cushing Aylwin (1806-1871), an original member of the LHSQ and grandson of Thomas Aylwin (c. 1729-1771), one of the early British settlers in Quebec. Books from these libraries can be identified in a variety of ways: there are more than two dozen titles with LHSQ-related provenance, identifiable through a variety of provenance evidence types recorded in the notes of catalogue records*. Types of provenance noticed to date are shown below. *In order to search only the Notes fields of catalogue records for terms like “Literary and Historical Society”, “Aylwin”, “Morrin” or “Quebec Library”, use the Advanced Search of the Classic Catalogue. Let us know if you notice these signs in books for which the provenance is not recorded! This volume of medieval theology offers a rare window into some of the difficulties encountered by scholars in Germany in the years leading up to the Second World War. 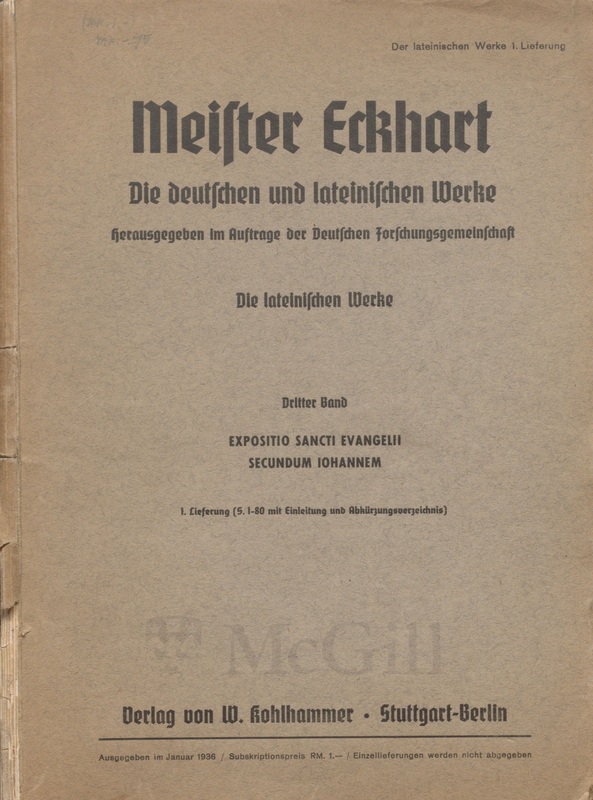 As a young scholar at the University of Heidelberg in the early 1930s, historian of philosophy Raymond Klibansky (1905-2005) planned a critical, multi-volume edition of the Latin works of medieval theologian and philosopher Meister Eckhart (d. 1327). Eckhart’s Latin works were less known than his German writings, and because the more scholastic style of these Latin writings involved formal referencing, part of Klibansky’s aim was to underline to a German audience the range of Eckhart’s influences, including Arab and Jewish thinkers. What may look now like an esoteric subject was at the time deeply political, as Eckhart was viewed by Nazi ideologues like Alfred Rosenberg as a father of Aryan thought. Several obstacles eventually led to the abandonment of Klibansky’s Eckhart edition project after only the first few volumes were published (Vol. 1; Vol. 2; Vol. 13 [=third]). Reasons for the termination of the project included Klibansky’s dismissal as a Jew from Heidelberg University, the seizure of his papers, his move to England, and obstructive measures taken by German authorities against his use of German-held manuscripts. At the same time, a second team was assembled within Germany to produce a complete edition of Eckhart’s works, in this case with the approbation of the government. This edition, the “Stuttgart edition”, produced the now standard critical edition of Eckhart’s works. 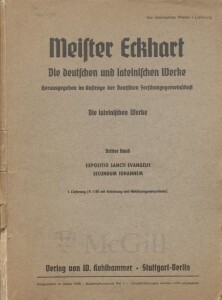 The volume shown here, part of McGill’s Raymond Klibansky Collection, is the third volume of the Stuttgart edition, published in 1936. The text is Eckhart’s commentary on the Gospel according to John (Expositio sancti Evangelii secundum Iohannem), a text that Klibansky and his team had begun preparing but had not published before the project was halted. The annotations are in Klibansky’s hand, and are extraordinary both in terms of Klibansky’s own habits and on account of their content. Klibansky did not normally annotate his books heavily. 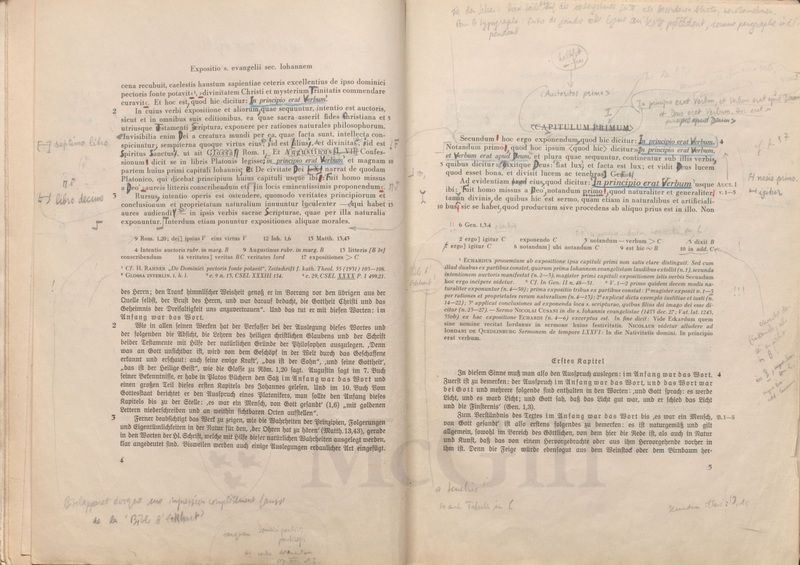 Here, however, nearly every page of the introduction and text, about 80 pages, is marked or annotated in some way. He comments, for example, “Consequentia falsa” (p.xii), “Nonsens!…” (p.3), or “Stupidité de note…” (p. 8). Also, strikingly, there are several handwritten instructions for a typesetter—in both French and German—to reorganize bits of text, as if this were a manuscript in preparation for new publication. This document offers extraordinary access to an author’s scholarly but also emotional response to a contentious publication. The volume has not yet been the subject of detailed study, and can be consulted in RBSC; this particular text is in volume 3, part 1 (3. Bd., Lief. 1). Learn more about Klibansky and the Raymond Klibansky Collection. This rare item is available to explore online or in person in the reading room. * An introduction to the literature of vertebrate zoology : based chiefly on the titles in the Blacker Library of Zoology, the Emma Shearer Wood Library of Ornithology, the Bibliotheca Osleriana and other libraries of McGill University, Montreal / Compiled and edited by Casey A. Wood. London : Oxford University Press, 1931.